Arizona Tiger Salamanders are large and stocky with small beady eyes, a broad, rounded snout and . Color can vary greatly depending upon the age of the salamander and location. 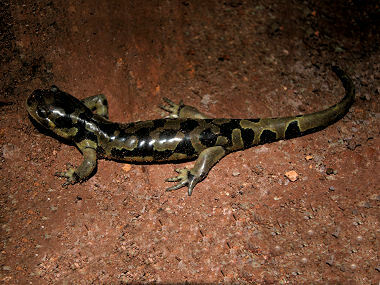 The Arizona tiger salamander, known from the Mogollon Rim area and the Colorado Plateau, is a dark grayish to olive salamander often with yellow to olive spots and blotches that have irregular edges. However some salamanders are mostly plain olive or yellowish in color. Adult terrestrial tiger salamanders grow to as much as 13.6 inches, total length. Arizona Tiger Salamanders live in ponds, reservoirs, lakes, temporary rain pools, streams and stock ponds in conifer forests, chaparral, and high grasslands. Adults spend much of their time underground in burrows. Breeding occurs from mid-winter into late spring and rarely in late summer. 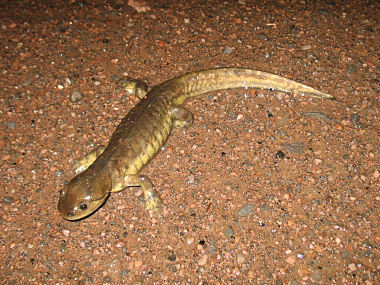 The best time to spot an Arizona Tiger Salamander is at night after rainstorms, when they may be found migrating to breeding areas. Larvae salamanders undergo a metamorphosis as they age which includes four adult forms: a terrestrial adult form, an aquatic gilled adult (branchiate) and a cannibalistic form of each. The terrestrial adult lives mainly on land, only returning to water to breed. The gilled adult stays in the breeding pond and lives an aquatic lifestyle. Occasionally a cannibalistic morph develops. These salamanders develop larger heads, mouths and teeth and will prey upon others of their own species. Tiger salamanders also eat a variety of invertebrates and vertebrates.